Reading, 17 March 2016: Facebook is the most accurate digital channel for retail customer service, ahead of email and then Twitter, according to new Eptica research. 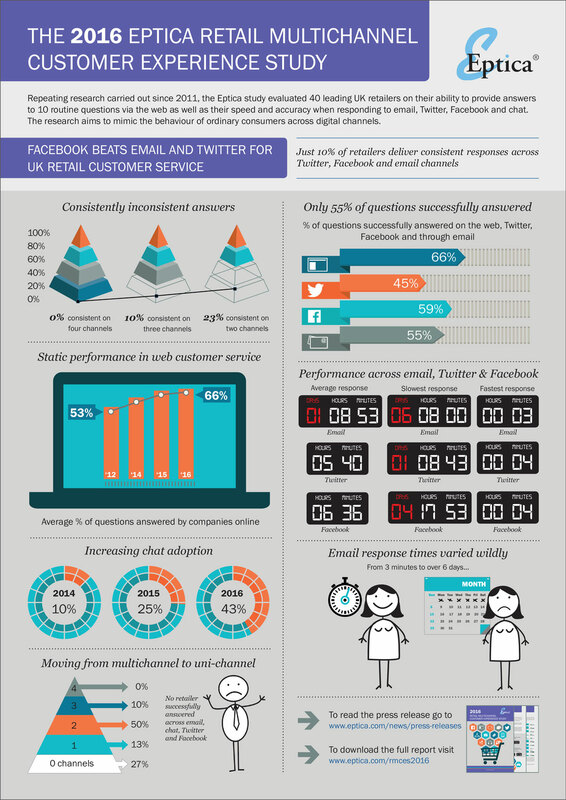 UK retailers could successfully answer 59% of questions asked on Facebook, 55% on email and 45% on Twitter, although only 10% provided consistent responses across these three channels. This is in stark contrast to the US, where email beat social media as the best channel for customers looking for answers to retail customer service questions, according to a previous study by Eptica. In the United States retailers successfully responded to 73% of queries asked via email, 54% on Facebook, but just 20% on Twitter. As part of the Eptica Multichannel Customer Experience Study (http://www.eptica.com/rmces2016), 40 leading UK retailers, split between 4 sectors (food & wine, consumer electronics, entertainment and fashion) were evaluated on their ability to provide answers to 10 routine questions via the web as well as their speed and accuracy when responding to email, Twitter, Facebook and chat. Repeating research carried out since 2011 the study, from multichannel customer interaction management software provider Eptica, aims to mimic the behaviour of ordinary consumers across digital channels. Overall, the UK research found minor changes in performance since 2015, with the total number of questions answered on the web, email and Twitter remaining static at 55%. Company websites provided responses to 66% of questions, up 1% from last year, while the email channel has become less accurate over the last year, successfully answering 55% of questions (down from 58%). Twitter improved by 2%, responding to 45% of queries, despite the fact that 95% of retailers now have a presence on the channel. In the UK, this was the first year that Facebook customer service was surveyed, and it immediately established itself as the most accurate channel, answering 59% of queries. This masked enormous discrepancies. Just one food and wine retailer replied on Facebook (despite 90% offering the channel) – and then it failed to provide a helpful answer. Facebook was also slower than Twitter, taking an average of 6 hours 36 minutes to respond, against 5 hours 40 minutes. On email, there was evidence that a growing number of companies are switching off this channel. 88% of retailers offered email to non-customers, 10% fewer than in 2015. Additionally, while the average speed of response had improved by over 10 hours, it still took 32 hours 53 minutes – nearly 1.5 days, to get an answer. There were considerable differences in response times – one consumer electronics supplier replied in 3 minutes, while an entertainment retailer took 152 hours. Comparing the performance of different retail sectors, entertainment remained bottom (answering 38% of questions on the web, email and Twitter), followed by food and wine (60%), consumer electronics retailers (55%) and fashion (68%). The Eptica Study also evaluated businesses in banking, utilities, telecoms, electronics manufacturers, travel companies and insurers. In comparison, retail consistently outscored the overall average of all ten sectors on email, Twitter and Facebook. Within the entire study only 38% of emails were answered successfully, compared to 53% by retailers, with accurate Facebook responses for the four retail sectors (at 59%), 15% higher than the overall average of 44%. 3% fewer questions were answered by non-retailers on Twitter, while the web was identical, at 66%. The research found that companies are increasingly failing to deliver a consistent service across multiple channels. No companies successfully answered on four channels (email, Twitter, Facebook and chat), and just 10% gave a consistent, accurate response on three. 68% of retailers (including all ten food and wine companies) did not provide any consistent answers at all on more than one channel, either because the responses did not match or due to lack of accurate replies at all. Illustrating this, one entertainment retailer answered a question on Facebook in 6 minutes, yet took 152 hours to respond to the very same query on email. Chat was the final channel surveyed. While just under half (43%) of retailers claimed to offer it, only 13% of companies had it operational when tested, up from 5% in 2015. The performance of those offering chat has actually deteriorated since last year, from 100% successfully answering the question, down to 60% in 2016. Average time to answer nearly doubled from 5 minutes 30 seconds to 9 minutes 40 seconds. The full findings, highlighting how the retail sector performed within the Eptica Multichannel Customer Experience Study, along with recommendations for areas to focus on, are available in the Eptica Retail Multichannel Customer Experience Study, which can be downloaded from http://www.eptica.com/rmces2016. Can I add items to an order before it is delivered? Can I return items bought as presents? As well as retailers, the Study surveyed websites across the insurance, travel, consumer electronics manufacturers, utilities, telecoms and banking sectors in Q1 2016: The full Eptica Multichannel Customer Experience Study report can be downloaded from http://www.eptica.com/mces2016.